With fall on the way I am happy to start using my oven again. Strangely enough it has been in the 90's all week here in NY. It was cooler in August. I still have my air conditioning on but can't wait to keep the windows open every day. I have been planning on starting to bake a bit more. Baking is not one of my stronger suits. It is something I look forward to working on this fall and winter. There is nothing better than the smell of bread baking. 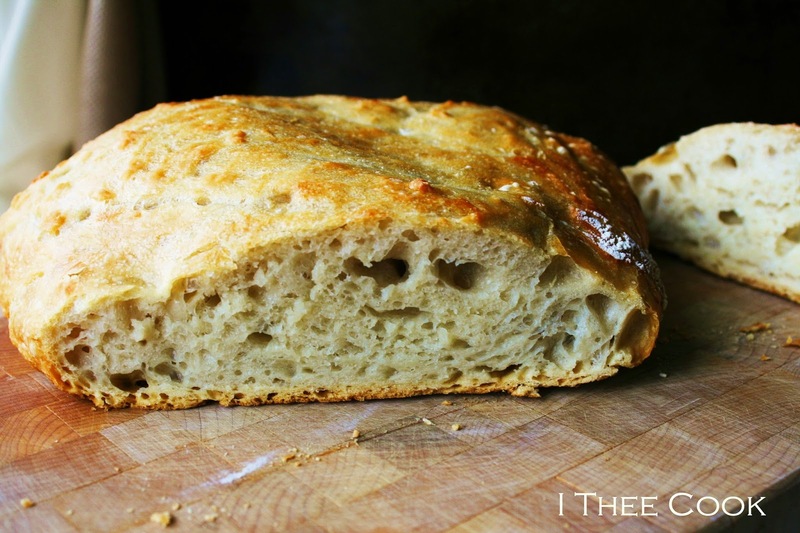 I have to say this was the easiest bread recipe I have ever made. It does take some time so you have to be patient but it is way worth the wait. This came out more like a ciabatta bread. Crusty on the outside and very airy and soft inside. I may have let it sit a we bit to long during proofing. Regardless it was still great. In a large bowl, stir together the flour, salt and yeast. Add the water and honey using a wooden spoon stir together until the mixture resembles a shaggy dough. It will be very sticky. After dough is ready, preheat your oven to 450 F.
After the 30 minutes are up remove the dutch oven (remember it's super hot) and with floured hands place the bread dough into it. Replace the cover and bake for 30 minutes covered. Then remove the cover and bake for an additional 15 minutes uncovered. Bread will be golden and crusty. Nothing better than bread making, I find it therapeutic too. This looks amazing!! Really looks great! I am looking forward to fall and baking more, too. I also want to get better at making bread. I love artisan breads! I want to try this recipe with spelt flour. I don't have a dutch oven, but I have found that I can use a glass covered casserole dish and that works fine too. I've always wanted to try this type of bread. Thanks for sharing with Foodie Friends Friday. Hope to see you again next week! Oh yes, I can almost smell it! Thanks so much for sharing your awesome post with Full Plate Thursday. Have a great week and come back soon! Loved this recipe and spread a lot of love your way this week. Thanks for sharing at Foodie Fridays. can't wait to see what awesomeness you are sharing next week.